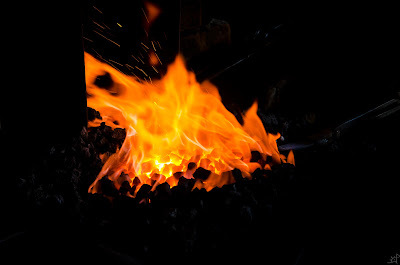 With the opportunity to work in an old shop as a living historian, inspiration has taken its hold over me to begin pursuing a number of projects which have been brewing in the years that I have been without a regular place to light the forge. More, doing so without modern equipment, it has expanded my ability to critically approach a problem which would have been inconsequential with a different set of tools. For this project, I wanted to create the first in a series of efforts towards a pattern I have been developing and puzzling over. 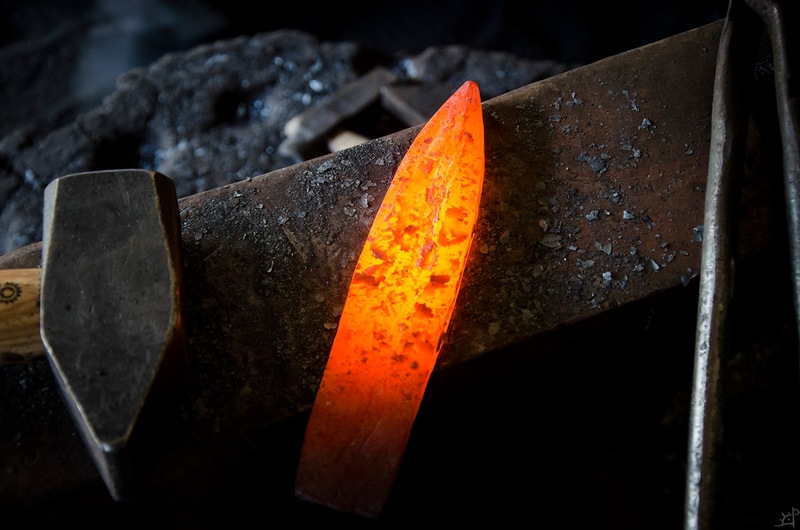 Here, I will forge a spear head with an opposing twist, serpentine core and a 5 layer edge. For the core bar, as I mentioned above, there are two opposing twists. I did not take any pictures of this process, and may do so eventually, but it is fairly simple to execute. Each of the twists began as a 11 layer (maybe...I set the welds on these a long, long time ago) billet of 1095 and 15n20. 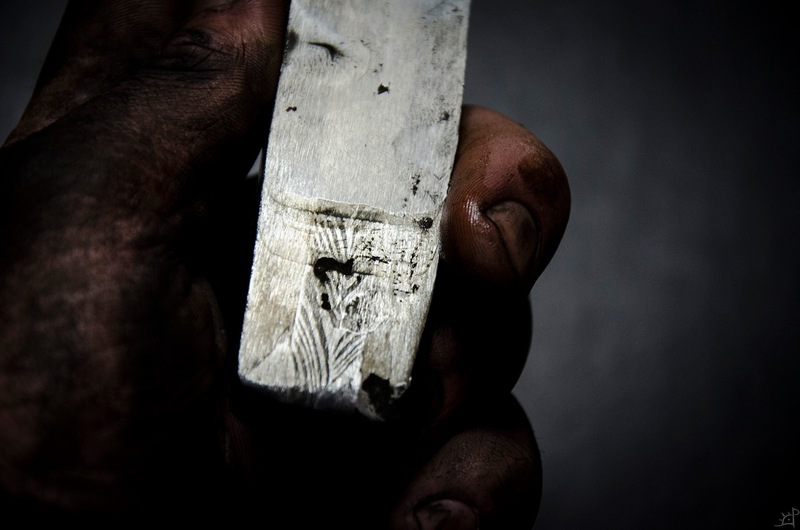 Once welded, they were drawn out by hand into a roughly 3/8" square bar as long as it happened to come out to be. From there, it was heated in sections and twisted by holding one end in the leg vice and the other in a wrench. 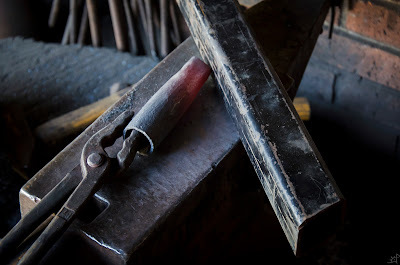 Although I do not have an exact measurement of twists per inch, as I did it by twists per bar, the tightness of the twists was just enough that the corners of the square cross section began to meet. Of the two bars, one was twisted clockwise and the other anticlockwise (or sunwise and widdershins if you're weird). 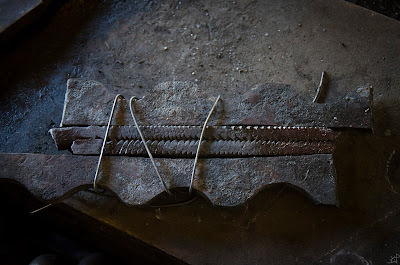 Upon successful twisting, the two bars were then gently forged back into a generally square bar and welded together. The result is shown in the centre of the steel above. That bit was forged from some leftover material, ignore the two edge bars there. Now then, onto the spear's edge. 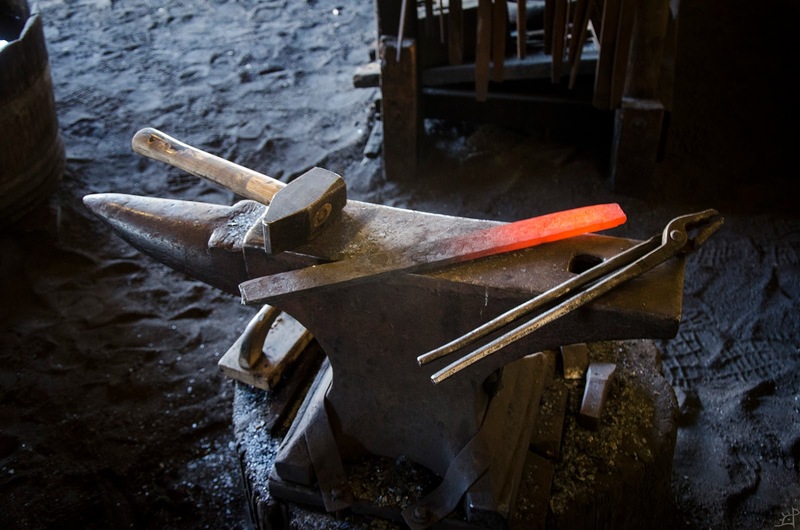 The majority of the billet's manipulation will be done by forging the edge bar, so first it needs to be made. I drew out a cladding of wrought iron from an excessively large bar I had handy, then placed it on either side of a 15n20/1075/15n20 cluster. 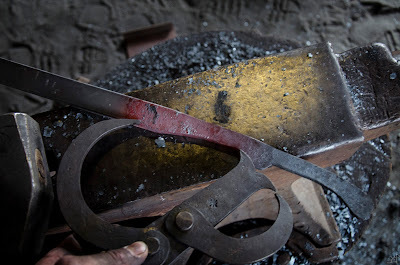 Lacking modern welding equipment to hold the billet together, I pretended to use bits of twisted wire while holding it tightly in a pair of tongs while the far end came up to temp. I have never progressively welded in sections quite like this before, but I was pleasantly surprised by how nicely it turned out. Using overlapping welding heats, I moved from one end down to the other, careful not to stress the billet or forge too cold until it was entirely solid. Because the billet will be undertaking a decent amount of stress almost immediately, I wanted to be sure the welds were solid. A few things I have come to look for in the weld lines is, with thinner layers, the more obvious cooling of one spot more quickly than the rest of the billet. With this thicker stock however that doesn't work as well. Another thing is the formation of the scale. However tight the layers against one another, unless it is actually welded, the scale will not form across that line. That makes it really clear that the weld did not take. 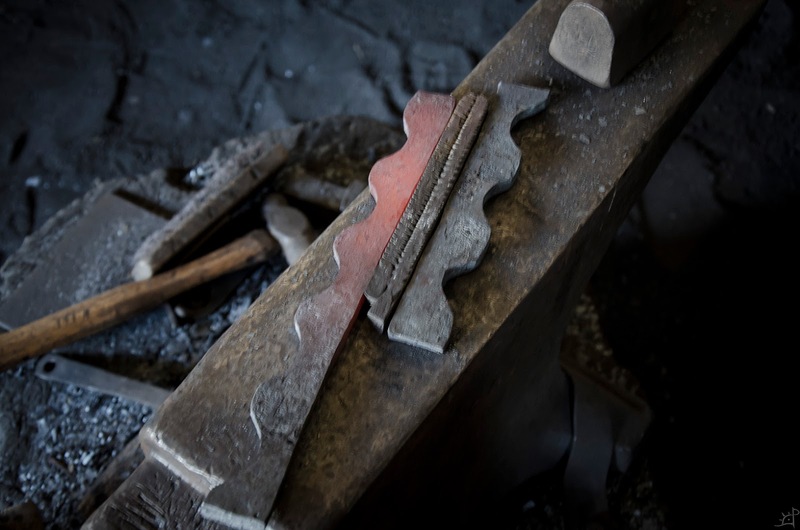 With steel that is not perfectly the same thickness or exactly aligned, that might be deceiving in that the unevenness is the cause rather than the lack of weld. 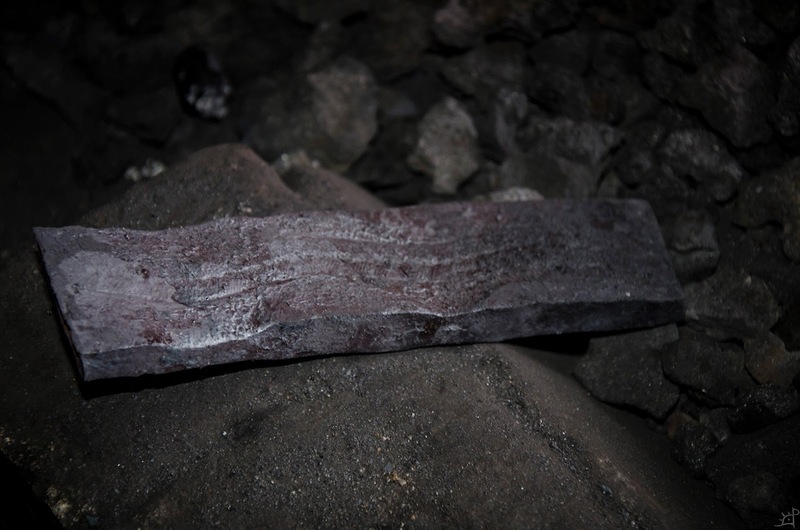 So, when I felt it was solid, I forged a small bit on edge to bring it down flat and watched for delamination. Eventually, it will all need to be flat anyway, because I cannot go back and grind it before welding the edges to the core. Without being able to grind the steel exactly where I needed it to form the serpentine shape, I had to come up with another way of getting there without any serious (any at all really) stock removal. If I had a press, I would have made a set of dies to get the undulations exactly even and repeatable, but since I do not, I had to think of a way of doing it by hand. Which looked a little something like this. Had I been a bit more proactive in the planning department, this probably would have gone better, but ultimately it worked so that's all I will say on it. While it looks strange, the top of the bar above will actually be the centre. I measured as best I could for the spacing, but until I set a few of the sinusoides, I wasn't entirely sure how far it would distort in length. At this point, I intentionally left the 'spine' thicker where I hammered down on it so that when I came through later and forged the edge flat, the upsetting in the lumps would more or less match. In case that last picture was confusing, this is the rough layout. The phase of the waves are offset so that when I forge it back into a rectangle, the core will distort into the snake pattern. 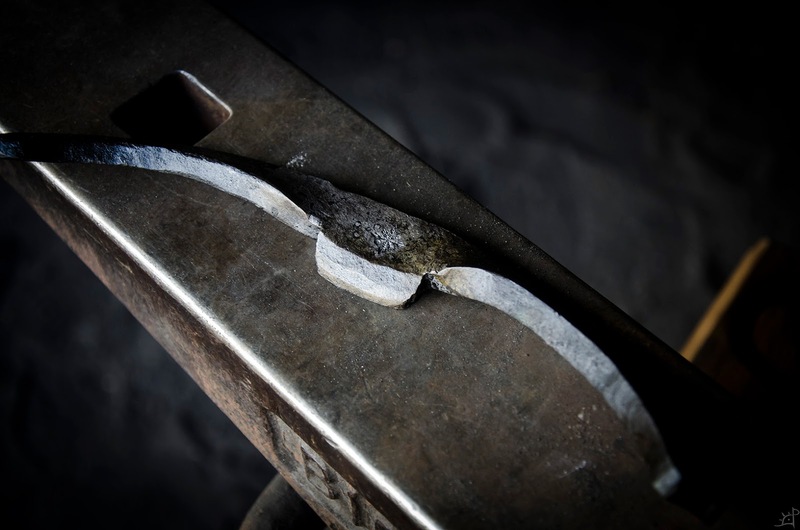 Above, the opposing twists are already welded together and the sides slightly flattened by forging and hot rasping. Originally, I intended for the extra bit of edge bar at the top to be forged down around to meet the other side, but that did not work at all, so I changed plans a bit later on. Also, to conserve material, I used the bits of the core that were clamped in the post vice as where the tang of the spear blade meets the socket. That way, the bars are continuous but I am also making use of the untwisted material. If I was pretending before about using wire to hold the billet together to set the weld, I might actually be out of my mind here. I had a grand vision of this working in some capacity, but the shapes were literally impossible to hold long enough to set a weld without having a face sized clinker stuck between the weld surfaces. In the end, I took off one edge and set the weld with the core, then came back for a second pass. But, due to the shape, I could not put the welded side down and use the same fullering hardie to set the top weld. In the end, I went to the post vice and clamped the pants off it. Although it did introduce a bit of buckling, it was nothing that could not be fixed later. Once it was welded firmly, I began forging it back into a rectangle. To do this, I used that huge swage block in the top picture of the first post, setting the peaks of the wave on either side of a matching U of the swage. That seemed to give me the best return of straightening v. upsetting of the various surfaces I tried forging on.Once squared up, I hot cut the ends to make it less weird looking and more manageable for the next part. Here, I addressed the issue of not being able to drag the extra bit of edge bar down around the tip. Which is fishmouthing the end! This was another thing which gave me a lot of thought. Initially, I was going to leave the edge bars long and sort of wrap them around over the end of the core, because I was not sure if the end would be in the centre of the bar after welding. As it worked out, I could hot cut a V into the end to where the core met the centre of the billet and just do the ole' fish mouth weld. Also, as you can see above, the core is far less wavy than the frequency of the wave in the initial edge billet. Approaching this with a press, I think I could get the serpent a fair amount tighter, but the concept still worked I suppose. Having never done one of those fishmouth welds before, I was worried about the shear stress of forging down the edges, but it did not tear open or even threaten to. On such a young weld, I was convinced that it would at least try, but after coming together, it stuck like wet noodles to drywall. The next needlessly time intensive part of this ordeal was to forge the socket. Since I did not have anything round or remotely close to the right size, I had to neck down a 2,5" square pipe to the marginally smaller tube of a socket. Cutting an arbitrary length of pipe off of the bar with a hack saw took way too long, but when that was over with, it was on to making it round. Necking down pipe without it collapsing is tedious to say the least, especially when the final diameter is about a third of the starting. To do this, I worked it one end backwards to form the taper of the socket, keeping it nice and hot and rotating it constantly to prevent the formation of corners or buckles. Once the spear end was close to the size needed to fit the stub tang, I squared (rectangled) the joint. I found that having a square/rectangle when welding is much easier than trying to get two round things to mate perfectly. With the socket hot and spear cold, I cold fitted the joint before welding. 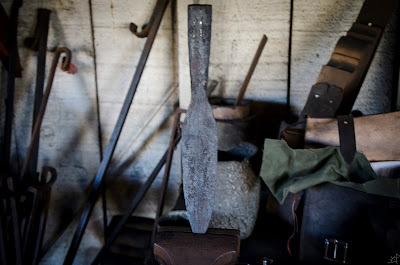 As the spear was, the tang tapered outwards towards the blade, making a wedge for the socket to fit into. On the socket end, it was opposite. 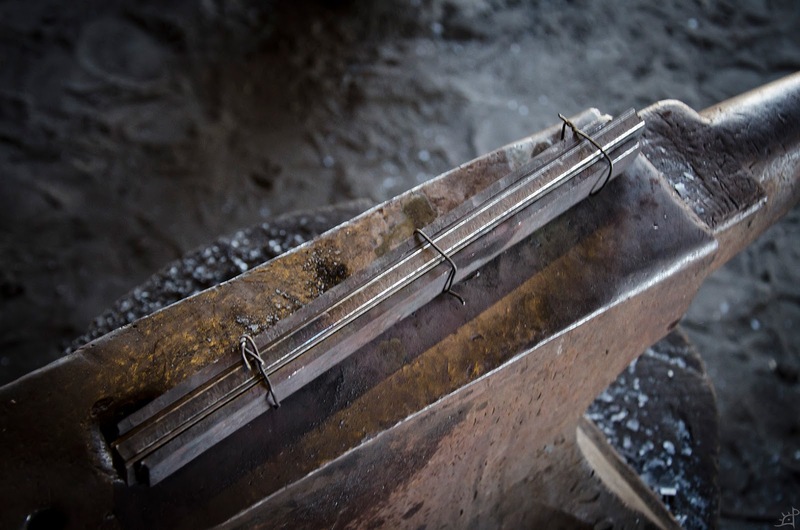 the necking goes down to the tightest point just before where the weld will be, then flares slightly back open to accept the wedge. This is important if you want more than the very end of the socket to weld to the blade. 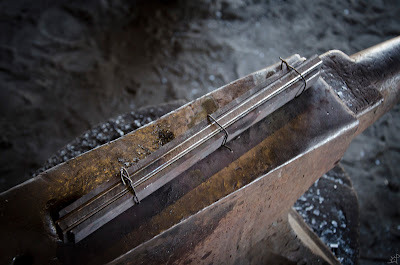 When actually setting the weld, I used a hefty amount of flux, combined with a pinch of coal dust, and down into the socket a bit of iron powder. The coal dust burns out any extra oxygen, the flux does normal flux things but also draws in the iron powder which acts almost like a metal velcro to set the weld. Because there was no good way to clean the inside of the pipe socket before welding, I wanted all the help I could get. 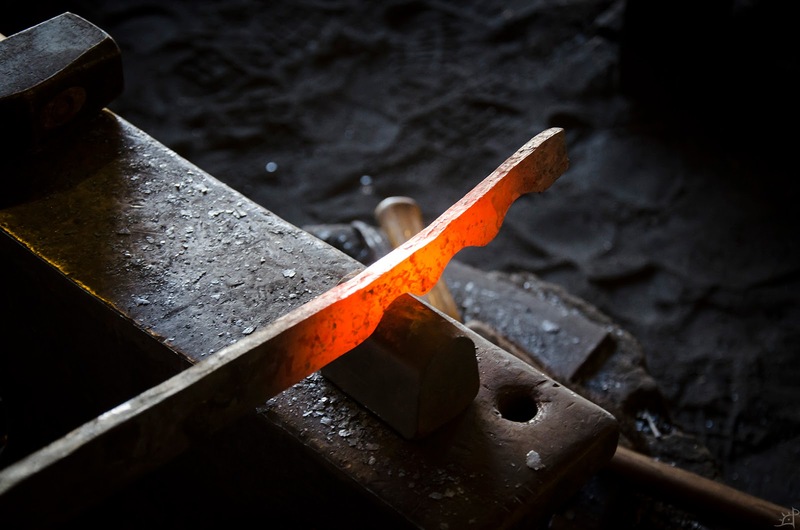 When hot, I stood the socket on the anvil and hammered down on the point of the blade. That set the weld, repeated two or three more times, until I was confident in it. Then, it was over to the horn and forging down on the socket like when I was necking it down. After that, the only thing left to do was straighten the blade/socket joint and make sure everything was gravy. Since I do not have any modern equipment, I also have no way to grind the blade now that it is forged to shape. For the edges, a hot rasp will make fast work of it, but the faces are another story. I have no desire to drawfile this thing, so I made a scraper instead. Given the only other scraper experience I have is from about 6 years ago and didn't involve determining the edge geometry myself, this was interesting and altogether pure luck. It is more or less like a draw knife with twisted handles that help facilitate the proper cutting angle of the edge, which is about 2/3 the width of one bevel of the spear's face. 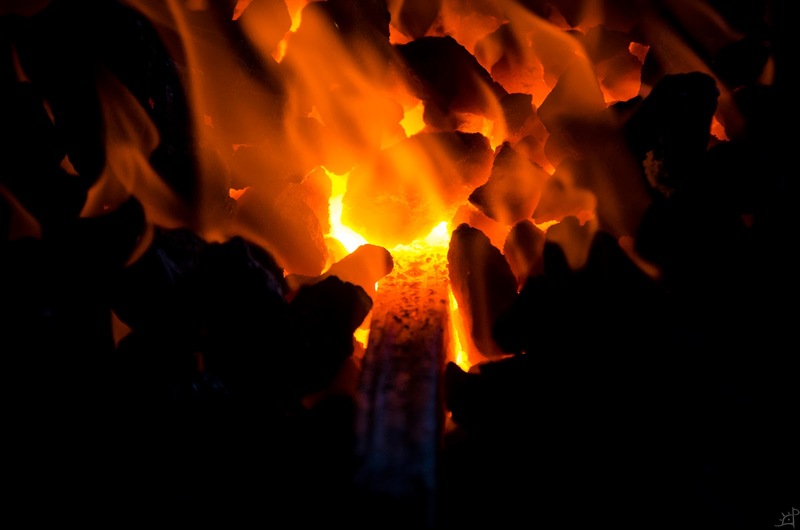 There is a very slight convex curve to it, and the angle is as close to 45 degrees as I could forge by hand. I started by forging out a handle, then setting down a corner for the cutting edge. Using a pair of double calipers I made a few weeks back, I transferred the length of the first handle piece to get a fairly even match on the other side. Getting the twists was the only difficult part of the process, as I was not quite sure how far to take it. At first, I did a straight 90 degree twist on each handle, but that was way too much. So, I untwisted it, flattened, and went back for another round. In the end, it is around 50 degrees, which seemed a good angle for holding the scraper in line with your hands with arms parallel to the ground, allowing the cutting edge to meet the steel at the proper angle (whatever that is...) And then I heat treated it. Quenched into the house blend of oil, it hardened nicely. 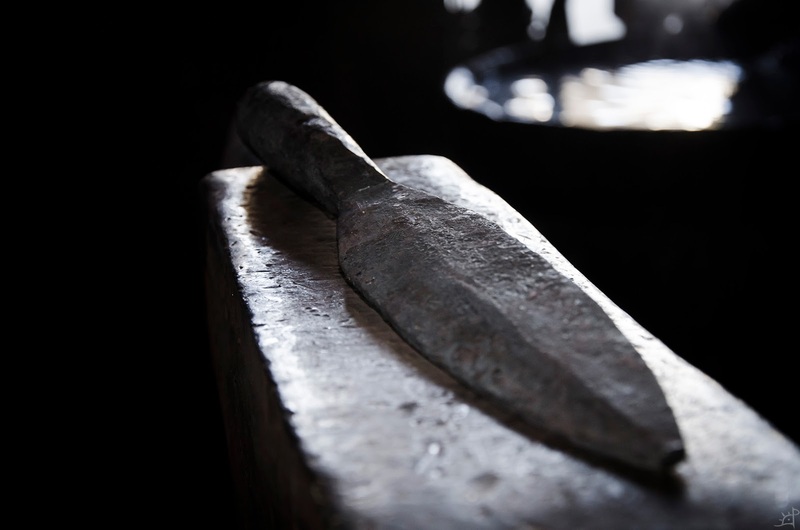 Before tempering the edge, I heated the handles from the outside in, relieving the hardness of everything through the corner where handles meets cutting edge. 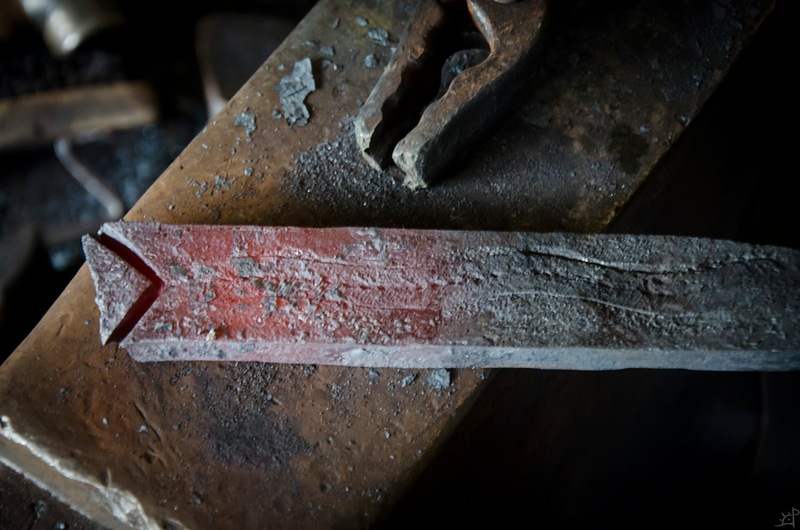 I assume that the edge itself needs to be as hard as possible, so I left it fairly hard, tempering it in the high 200s, low 300s F. And, I know it's not much of a looker, but in the 15 min I had to design, forge, and heat treat it, I was not overly concerned.